A engineer is always focused towards challenges of bringing ideas and concepts to life. Therefore, sophisticated machines and modern techniques have to be constantly developed and implemented for economical manufacturing of products. At the same time, we should take care that there has been no compromise made with quality and accuracy. Springs isolate the driver from road imperfections by allowing the tire to move over a bump without drastically disturbing the chassis. If the chassis remains fairly steady then the tires are better able to follow road contours automatically. Consumers also often change springs to alter their vehicle’s ride and handling characteristics. Spring problems are generally easy to identify. The working of hydraulic stiffness testing machine is based on Pascal’s law which states that PRESSURE APPLIED AT ANY POINT ON ANY CONFINED LIQUID IS TRANSMITTED EQUALLY TO ALL OTHER POINTS” This principle is same as that used in hydraulic press. Spring can be check without damaging the spring. No skill is required to check spring . The testing process is carried out in very less time, so production rate is very high. One man effort is enough to check the spring. Semi-skilled and unskilled labour can operate this machine easily. The system is self lubricating. As system is hydraulic, leakage may occur and hence refilling of oil is necessary. Stiffness of springs like leaf spring cannot be checked. 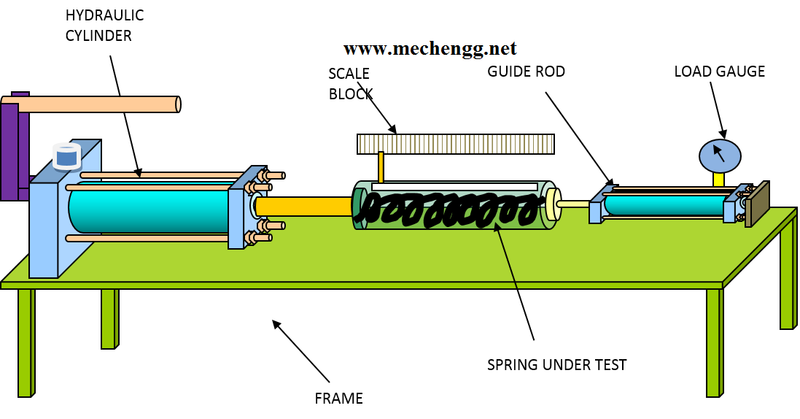 The machine is used for measuring spring stiffness for different spiral and helical springs in the range of 40mm to 60mm. Can be used in garages where frequent inspection of the suspensions of various automobiles is carried out. With the help of this machine it is possible to analyse when to replace the suspension by comparing the stiffness of the testing suspension with that of the standard stiffness.